Rahul Bajaj is one of India's leading business magnate who heads the Bajaj Group. The conglomerate based in Pune is responsible for the economic emboldening of the Indian middle class. Many of us have fond memories of riding the Bajaj Scooter. Much before Maruti forayed into the country it was the Bajaj Scooter which was regarded as a symbol of status and luxury among middle-class Indians. Speaking on the motive behind pursuing a business RAhul sheds some light onto his unique ideology. He believes the objective of a business is to satisfactorily meet the needs of a customer. "Why does one start a business? To satisfy a need -- whether it is a paan (betel nut) shop, a laundry, or a steel plant." Driving home his point further he says, "Similarly, we started Bajaj Auto because mobility was a need, people could not afford cars and public transport was inefficient or non-existent. "In today's competitive economy, if you do not meet customer requirements satisfactorily, you may have to close shop. We need not pat our backs because we have done something good for our customers. We have simply tried to meet their needs satisfactorily, efficiently. "Profits and employment are important byproducts of this process. If you do not satisfy customer needs, you can neither make a profit nor create jobs. "Your business has to be meaningful. You can dig a well and fill it up and say I am providing employment in the country. But that is meaningless." Here are some of the most inspiring quotes by the famous businessman Rahul Bajaj. 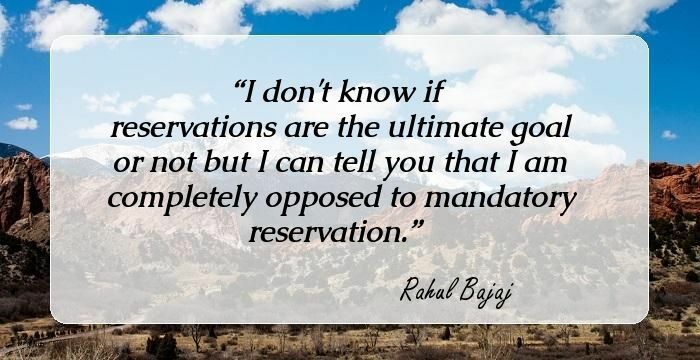 I don't know if reservations are the ultimate goal or not but I can tell you that I am completely opposed to mandatory reservation. It92s important that all of us work honestly, ethically and make all our choices consciously. 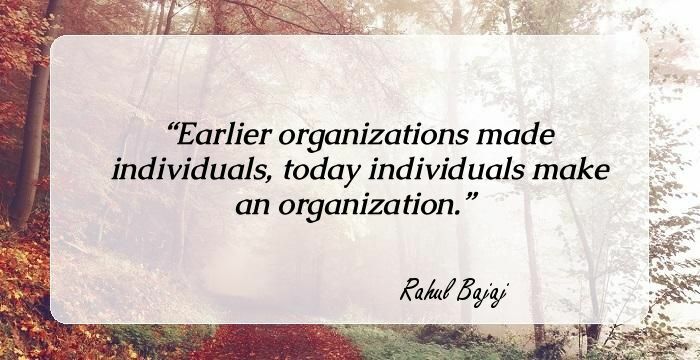 Earlier organizations made individuals, today individuals make an organization. We have not produced brands as far as education is concerned in India. Our nation is growing not because of its size or democracy, but because of its outstanding entrepreneurs and hardworking people. We are a true, proud and an independent nation only if we remove corruption from our country. Worry doesn92t make anything,but hard work. There will be a backlash from those who don't benefit from the system. Credibility depends on your track record, whether it's an individual or a corporate or a government.